Playing the tourist is thirsty work. 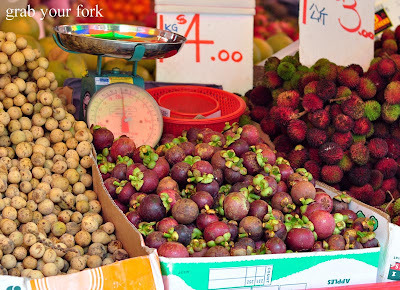 Our Singapore day tour, hosted by Nuffnang, boasted a jam-packed itinerary. By 1.30pm, we'd already visited the MINT toy museum and the Chinatown Heritage Museum, whilst squeezing in a second breakfast and a heart-shaped barbecued pork snack before lunch at the amazing Maxwell Food Centre hawker market. 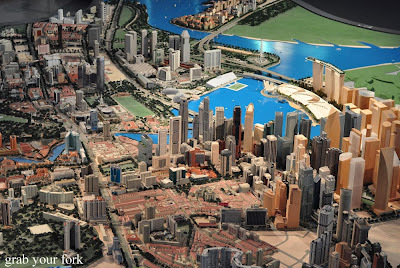 The touristing continued with a visit to the Urban Development Authority where hands-on activities, information panels and 3D models gave new appreciation of the intricacies of town planning. 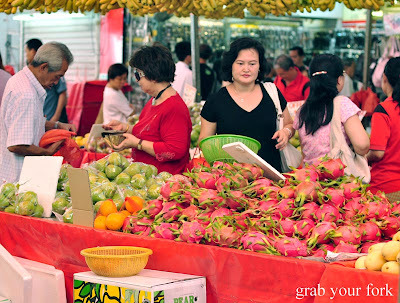 Then off to Bugis Street, a bustle of undercover market stalls alongside the gleaming modern monolith that is Bugis Junction shopping centre. We had a brief look at t-shirts, jewellery and souvenirs, but Suze and I really only had eyes for the food stalls. 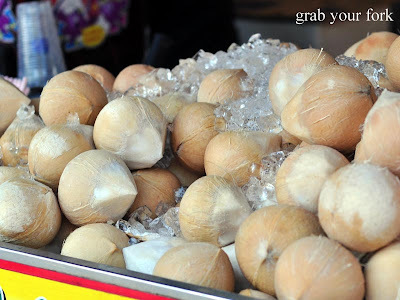 We were so tempted by the durian stands, their sweet fragrance punctuating the air with their unmistakable aroma. Eating durian takes time though, and we had little of it. Instead we found room for ice cream! For weeks, Suze had been taunting me with Singapore promises of ice cream! In slices! With rainbow bread! 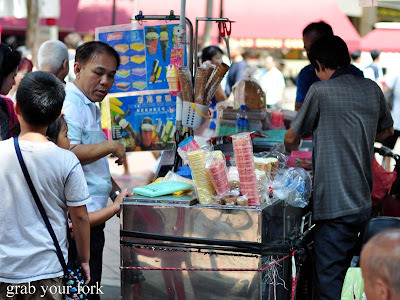 There's an element of theatre the way the ice cream vendors yank out slabs of ice cream wrapped in cardboard, and then uses a cleaver to carve the iced confection into thick icy doorstops. 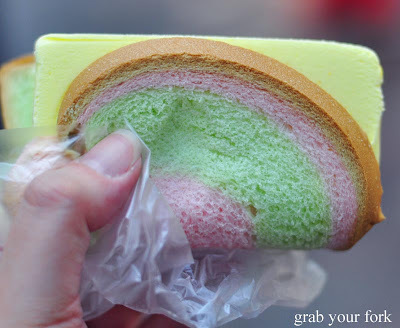 You can choose to have your ice cream sandwiched with wafers or rainbow bread. Suze recommends the bread as the wafer disintegrates and goes soggy. The bread is not sweet, despite its psychedelic swirls, but it's soft and fluffy, and makes a convenient carrier for the ice cream, both absorbing the drips and protecting your fingers from frostbite. My sweet corn ice cream doesn't possess much in the way of real corn kernels, but it's cool and refreshing and makes you feel like a little kid all over again. There's an obligatory photo stop at Singapore's famous Merlion in Merlion Park. The Merlion was designed by Fraser Brunner for the Singapore Tourism Board logo in 1964. 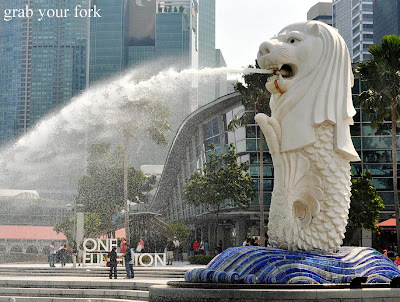 The head is that of a lion, referencing Singapore's original name "Singapura" which means "lion city". The Merlion's body is that of a fish, representing the sea and referencing Singapore's heritage as a temasek, or "sea town". 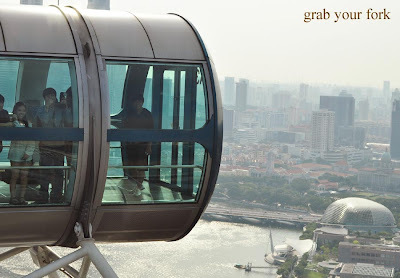 We get a bird's eye view of the island from the Singapore Flyer, the world's largest observation wheel that reaches a height of 165m from the ground. The entire loop takes thirty minutes. Are you tired yet? We were! 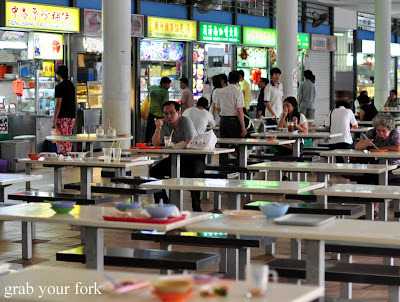 We ended up back at our hotel for a late afternoon snack at the nearby hawker centre in Tiong Bahru Market. 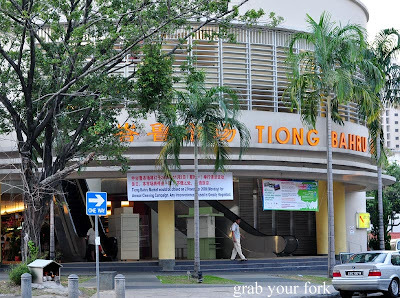 Tiong Bahru Market is said to boast some of the finest hawker stalls in Singapore. I, again, was astounded by its size. A short ride up the escalators brings you to hawker heaven. 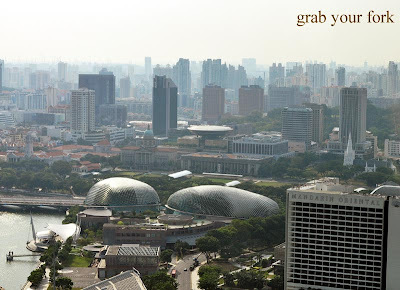 A circuit of the building takes you past a myriad of hawker stalls. Plenty of seating is provided and the ringed balcony in the middle overlooks a garden and the wet markets below. Howard, Teresa and Qing introduced Suze and I to their new favourite snack chwee kueh. 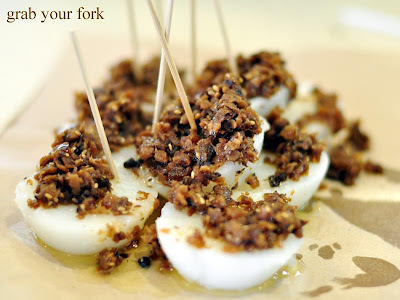 This traditional Singaporean breakfastcomprises steamed cakes made from rice flour and water that are topped with preserved radish and lashings of chilli oil. 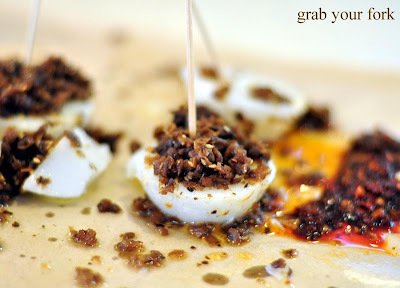 The plainness of the rice cake is a perfect vehicle for the salted crunchy radish and the fiery hit of chilli. 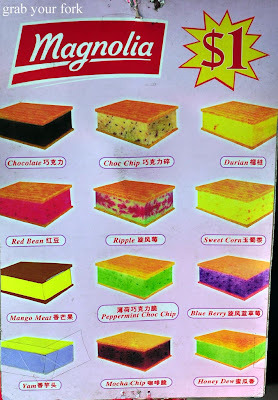 I also loved how these little cakes were served on a sheet of brown paper, the package folded over into a makeshift parcel that became your cheap-and-cheerful plate. Suze and I opted for dessert - mountains of crushed ice doused with coconut milk are my preferred heat saviour. Suze's red rubies in her dessert weren't quite as crunchy as we'd hoped. The red rubies are meant to resemble pomegranate seeds but are actually cubes of waterchestnut coated and boiled in red-tinted tapioca flour. The bright yellow and blue tapioca pearls were a little different to the boring brown ones we're used to. 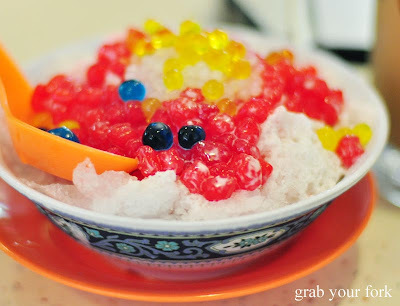 I'd tried to order an avocado ice kacang but as they were sold out, I settled with the gauva ice kacang, not so much with fresh fruit, but served a sweet and slightly tart guava syrup. Four hours later, we had had time for a quick nap and were hungry for dinner. It was almost 11.00pm but in Singapore, dinner time is anytime. Our destination was conveniently across the road from our hotel. 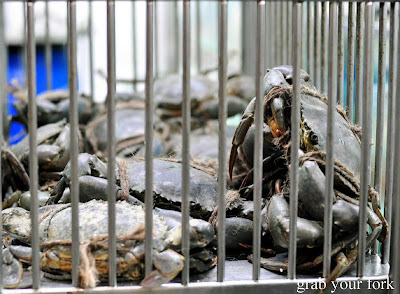 Sin Hoi Sai, we'd heard, had a reputation for good crab. 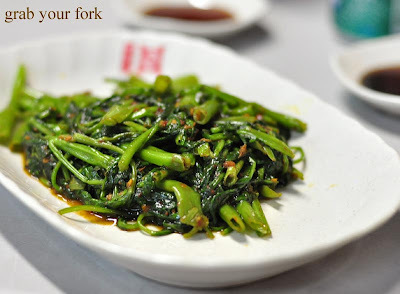 We started with soft wilted stems of water spinach, stir-fried with belacan shrimp paste. 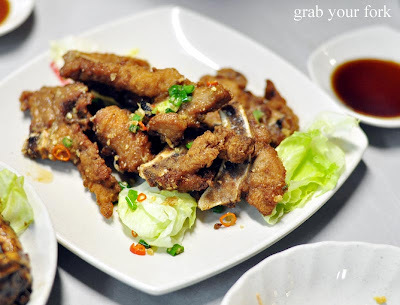 Salt and pepper pork ribs were tender with a sweet and crunchy batter scattered with fine slices of chilli. We ordered two crabs between the five of us. 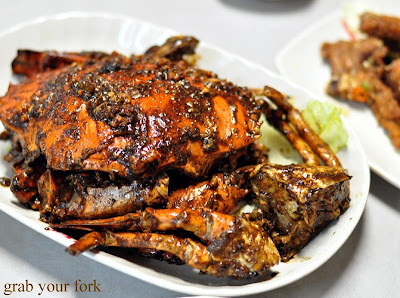 We'd been hoping for a crunchier version of the salted egg yolk crab (more like this version) but we all loved the flavour of the black pepper version, the mild heat of the pepper contrasting well against the sweet white flesh of the crab. My favourite dish of the night was the oatmeal butter prawns. 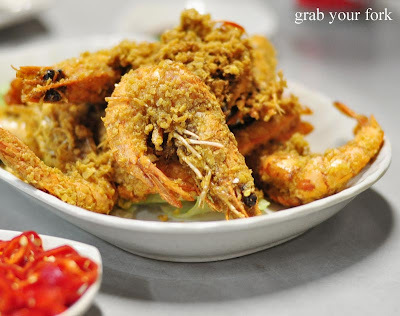 Think buttery oat clusters adhered to fresh prawns that have deep-fried so crisp, their shells can be crunched down whole. We paid about SG$30 per head for this feast. Singapore - give me more! Grab Your Fork travelled to Singapore as a guest of Nuffnang Australia for the Asia-Pacific Blog Awards. Did you miss out on hearing Grab Your Fork on ABC 702AM? You can hear Demis, Lorraine and I talk about our favourite Sydney International Food Festival events on Simon Marnie's Food at Eleven segment. Listen to a stream of the show (note: the stream is updated weekly). 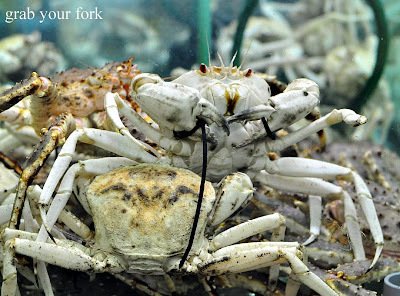 There was also a brief mention of Grab Your Fork in the news.com.au article "Australians win at Asia-Pacific blog awards". Great to hear bloggers are starting to register on the local news scene, and congrats again to all the Australian finalists and winners at the Nuffnang Asia-Pacific Blog Awards. Read the full article. mmm the prawns were soooo awesome! Helen I'm so jealous! I think my heart skipped a beat when I saw sweetcorn ice cream in the post title, pity it was lacking corn kernels. And ooh crab and prawns! 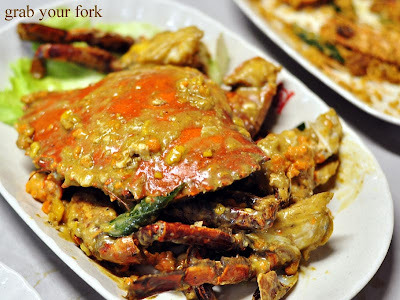 Though the salted egg yolk crab looks a lot wetter than the versions I've tried before. Love the Ribena cup. 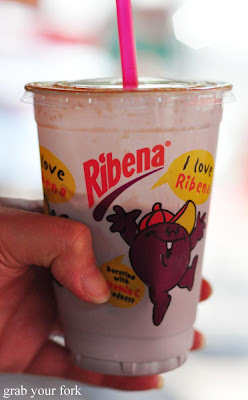 Speaking of which, I had some Ribena Slurpee from a street store and it was the BEST slurpee I've ever had. Also loved the irony of the ribena cup. I must say, I prefer the wafers though. Satisfying crunch and sweetness. The more I read about your time in Singapore... the more excited I am about moving there! The prices, the variety (at all times of the day/night!) Gotta love it! Really looking forward to it. Sweet corn ice cream? Sounds divine! that ribena cup is so cute! ive been thinking of taking a trip to singapore, your posts are making me think i should! man... we sound like pigs. eat, sleep, eat, and ummm eat. No wonder I felt sick after I got back... Looking at your posts and through my own photos, I now understand why I lost my appetite. 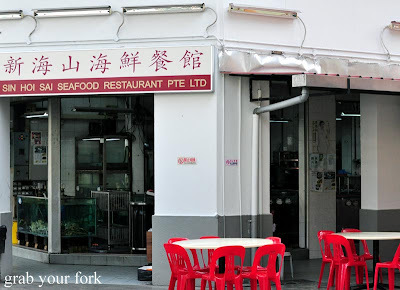 I will be posting up my adventures in sg food culture next week, so keep your eyes peeled! I love reading your blog Helen. Always with mouth watery pictures of food. Thank you . Ribena cup is so cute . Gastronomical overdose Helen!!!!!!!!!!!! Gaaaahhhhh it was like one food perve after another!!! 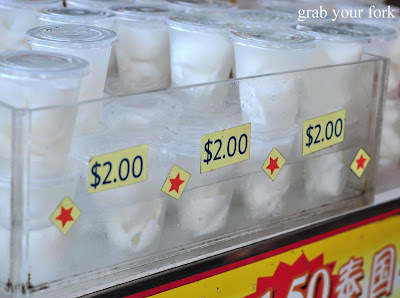 the chwee kueh @ TBM is prob what I would choose if I can only eat one thing in SG! But the skill to eat it elegantly is another subject matter completely...which I have yet to master. eewwwwwwwwwwwwwwwwwww durian eeewwwwwwww good choice with ice cream over durian :P hee hee looks like everyone had a blast and all that food yuuummm ^^! Hi chocolatesuze - I think those prawns changed my life. Where can I find these in Sydney?! 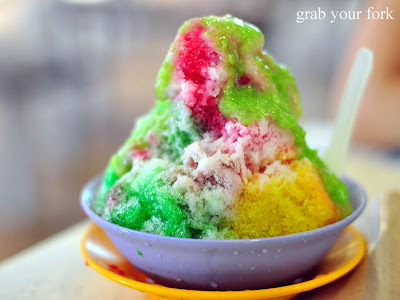 Hi Howard - A Ribena slurpee sounds amazing. Argh, curses to the constraints of the human stomach. Must remember to eat even more next time! Hi The Ninja - Ha, no problem. You often find both names printed on the menu in Sydney. The Ribena cup was super cute and yes, I meant to get a waffle for my next time but alas, it never eventuated. Curses to humidity and its appetite-dampening effects! Hi Billy - Ha, we know it was good! At least you're now a consummate professional in getting the dish up and plated! Would love to go to Malaysia. 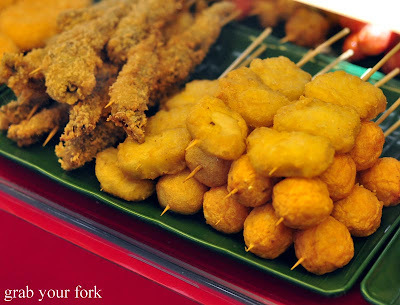 If Singapore food was amazing, I can only imagine how much better it is in Malaysia! Hi Sneh - Thanks so much for the recipe. I've printed it out already - will have to whip up a batch or two this summer. Can't wait! Hi thehealthyfoodie - The Ribena cup is gorgeous isn't it? I was really surprised by Singapore - for years I thought it would be staid and sterile, but there's so much vibrancy and colour. The Aussie dollar is doing well against the SGD too! Hi Cruxiefaye - Ahh I've had sporadic bouts of hives with prawns so I approach them with a little more caution these days. Allergies are unfortunate, especially when you still love their flavour! Looking forward to reading about your food adventures. Sounds like you found all the good eats! Hi bowb - Singapore was so much fun. Perhaps you'll have to arrange a little trip sometime soon? I can just imagine a little someone really digging ice cream in rainbow bread! Hi Julian Davis - Glad you enjoyed the post, and yes, the Ribena cup makes every drink seem better for you! Hi Kay - lol. Don't dirty that keyboard! Hi Trisha - Yep, Suze and I had one goal in mind - eat! 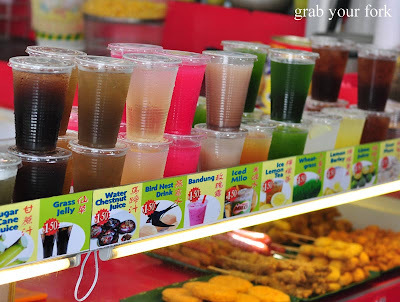 So funny to find ourselves wordlessly drawn to any stall with food or snacks! Hi Norman - Wow, I didn't realise the chwee kueh there was so revered. And eating elegantly is highly over-rated. In that kind of environment, I think the bigger the mess, the greater the satisfaction! Yuuuuuuuum - Bugis St markets and Tiong Bahru market have got to be two of my favourite places IN THE WORLD to eat. I'm gearing up for my 8th (!) trip to Singapore in March next year, taking the husb2be along for the first time. I loved this series of posts - it's given me some great ideas of places to visit on our trip, some of which I've missed in the past. Hi Erin - Apparently we missed out on all the good food stalls in Bugis Street. So annoying! lol.